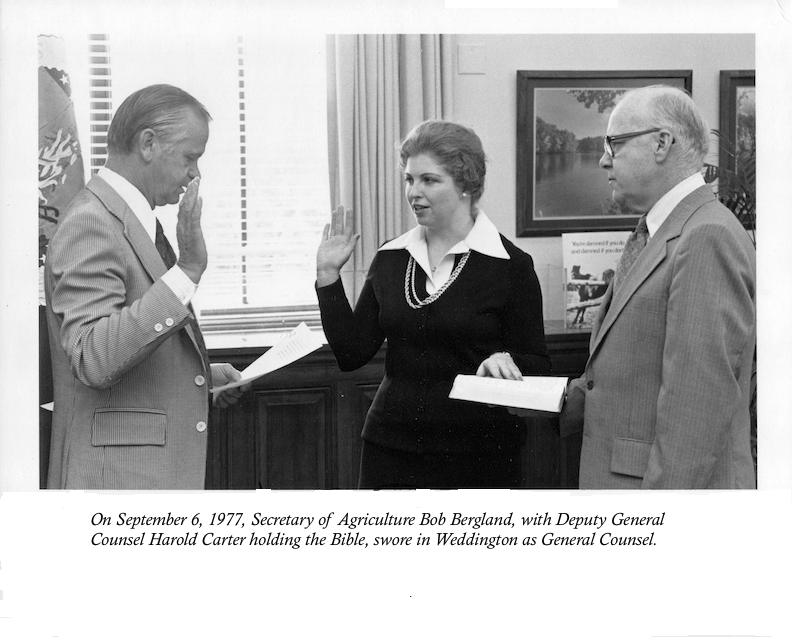 On July 15, 1977, Dr Weddington was nominated by U.S. President Jimmy Carter to be General Counsel for the US Department of Agriculture (USDA). The person in that position essentially heads a large law firm (called the Office of General Counsel, or OGC). The General Counsel is the legal advisor for the Secretary of Agriculture and is responsible for all of the legal advice and services associated with federal programs handled by the USDA. The USDA oversees a variety of government programs, such as food stamps, crop programs, meat and poultry inspection, agricultural marketing, and other regulatory functions. As head of OGC, she supervised over 350 full- and part-time employees, including over 200 attorneys located in Washington, D.C. and in 15 regional offices nationwide, and controlled a budget of over $9 million. Weddington's nomination, like many other presidential nominations, was subject to Senate confirmation. Ms. Weddington appeared on July 20 before the Senate Committee on Agriculture, Nutrition, and Forestry. Texas U.S. Senators Lloyd Bentsen (Democrat) and John Tower (Republican) endorsed her nomination. The full Senate confirmed her nomination on August 4, 1977. At age 32, she was the youngest person ever to serve as General Counsel of a cabinet-level department. Ms. Weddington was the first woman ever to hold the position of General Counsel, worked for the Federal Housing Administration (FHA), which finances many home purchases. Her duties also included overseeing international trade agreements regarding agricultural products and the WIC program of nutrition for women, infants and children. Weddington also served on the board administering the Graduate School sponsored by USDA. As part of her leadership at the USDA, Weddington oversaw the hiring of new attorneys with an emphasis on quality and on increasing the diversity of the employees of the OGC offices. She also encouraged the USDA Assistant Secretaries to adopt similar policies. Other important areas of legal work not generally identified with the USDA included the Community Development Division, the Legislative Division that monitored and commented on all legislation affecting USDA programs, and the Electric and Telephone Division (ETD). The ETD also worked with USDA programs financing construction of electric generation, transmission and distribution facilities, and telephone systems in rural areas. Weddington was appointed by President Carter to serve on the national board of the Rural Telephone Bank. Dr. Weddington was recognized by The District Lawyer, a publication of the D.C. Bar Association, as one of the federal government's top lawyers (Winter 1977). In addition to the more widely recognized USDA programs, her office also contained divisions that worked with the National Forest Service and the Soil Conservation Service. In that regard, Weddington worked extensively with the National Environmental Policy Act, the Wild and Scenic Rivers Act, the Wilderness Act, the National Trails System Act, and other national recreation area acts. She was particularly involved with implementation of the Wild and Scenic Rivers Act and went by horse back into the Big Bear Wilderness area of Montana to observe the application of the laws pertinent to very remote areas. 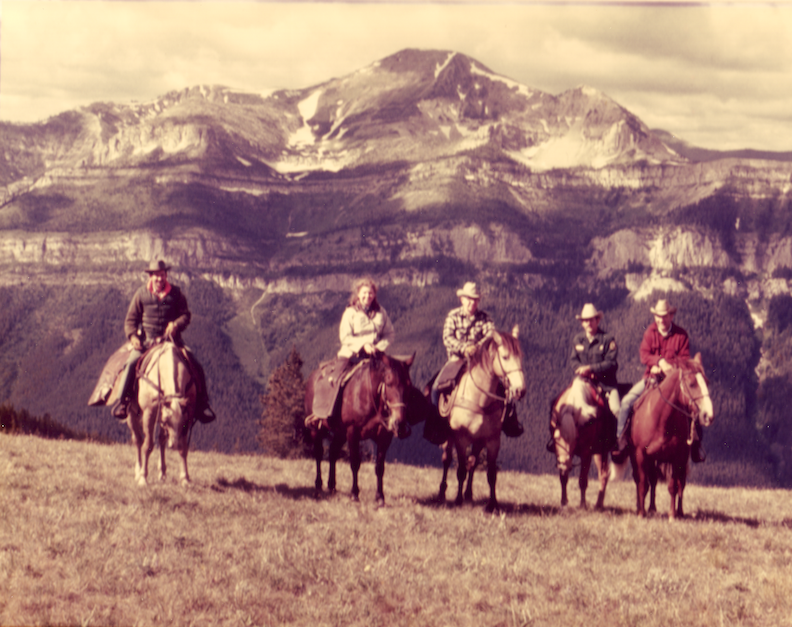 In the midst of almost a week of all day horseback riding in rugged, mountainous areas, she especially appreciated her riding experience growing up in Texas. A year after becoming General Counsel, Weddington resigned that position at the request of President Jimmy Carter to work for him in the White House as Special Assistant to the President.